Thank you for your interest in Personal Training at PTO Fitness Center! Every member is entitled to a Getting Started appointment, where a personal trainer will meet with you, discuss your goals, and get you started on a path to healthy lifestyle behaviors. To schedule your Getting Started session, contact Devon Grassi at dgrassi@pro-fitclubs.com. Download the Get Started Workout here! 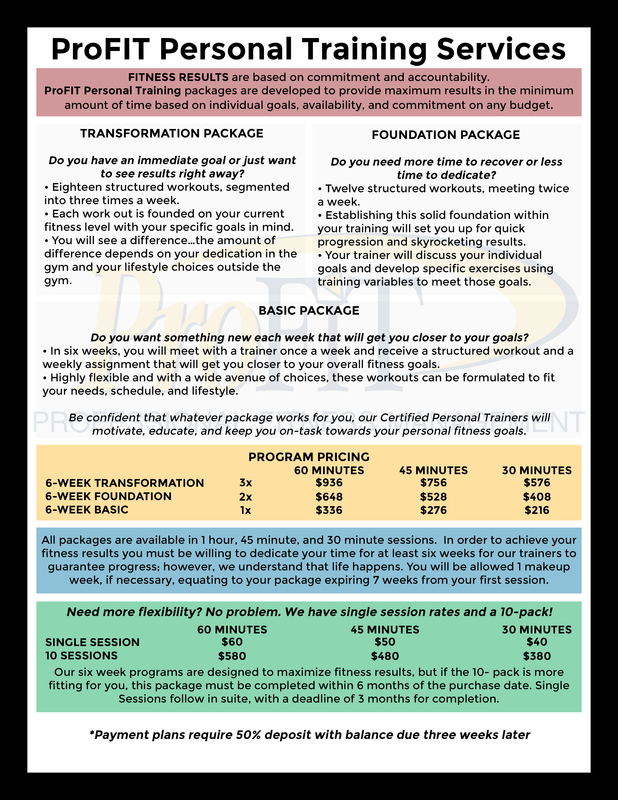 If you find that the Getting Started appointment was not enough, and you want more hands-on training, ProFIT offers personal training with a NCCA-accredited Certified Personal Trainer. All of our trainers are highly qualified to deliver your desired fitness needs. Monday:5:45 a.m. to 8:30 p.m.
Tuesday:5:45 a.m. to 8:30 p.m.
Wednesday:5:45 a.m. to 8:30 p.m.
Thursday:5:45 a.m. to 8:30 p.m.
Friday:5:45 a.m. to 8:30 p.m.
Saturday:10:00 a.m. to 4:00 p.m.